Lunchbox Dad: How to Make a St. Patrick's Day Lunch! St. Patrick's Day is one of those holidays that are really fun to be a part of. I don't think this day gets nearly the attention it deserves. Maybe the amazing corned beef and cabbage is wasted on too many people. Regardless, it's a fun day to send your kids off to school with a special lunch made in a festive lunchbox. I was able to order this St. Patty's Day themed yubo lunchbox from Zazzle.com. In fact, Zazzle carries many variations for just about any occasion! You can also customize these lunchboxes with your child's name or picture. The faceplate can come off and be switched with any other ones so you can use the same lunchbox, but just give it a different look. 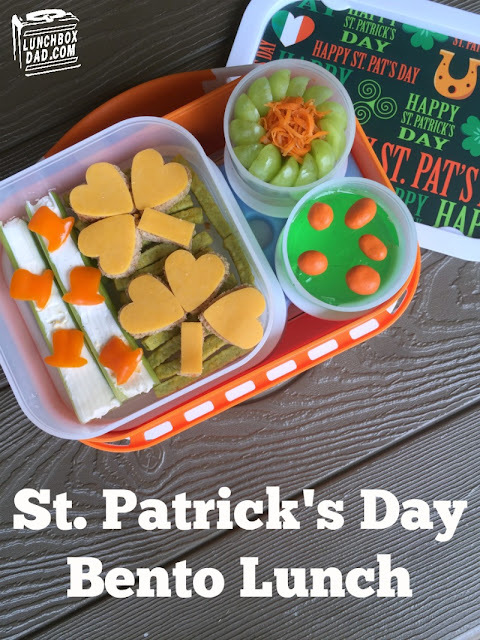 Make sure and check out all of Zazzle.com as soon as you read now to make my St. Patrick's Day lunch! 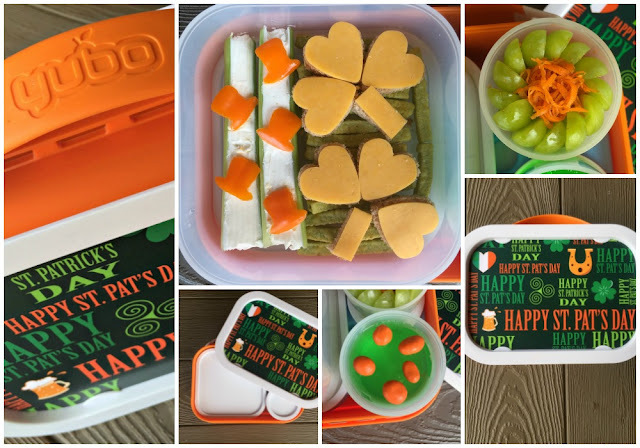 Ingredients: Green grapes, shredded carrots, lime jello, orange colored yogurt covered raisins, celery sticks, cream cheese, orange sweet peppers, green veggie straws, whole wheat bread, cheddar cheese. 1. Cut two shamrocks from whole wheat bread and cheddar cheese slices. Use a shamrock shaped cookie cutter or you can use a small heart shaped cutter. 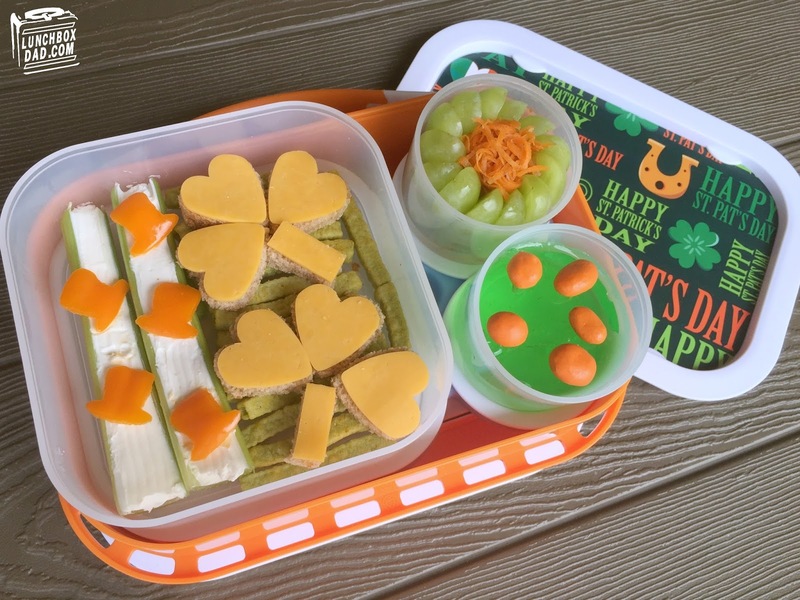 Arrange green veggie straws in the main container and place the bread and cheese shamrocks on top. You can "glue" the cheese on with a little mustard or mayo if desired. 2. Spread cream cheese on celery sticks. Cut sweet peppers in half and then cut out tiny leprechaun hats. Place on top of celery and then put the celery sticks in the main compartment. 3. Cut grapes in half and arrange in a circle in small container as shown. Stuff middle with shredded orange carrots. 4. Put lime jello in small container. Top with orange yogurt covered raisins.